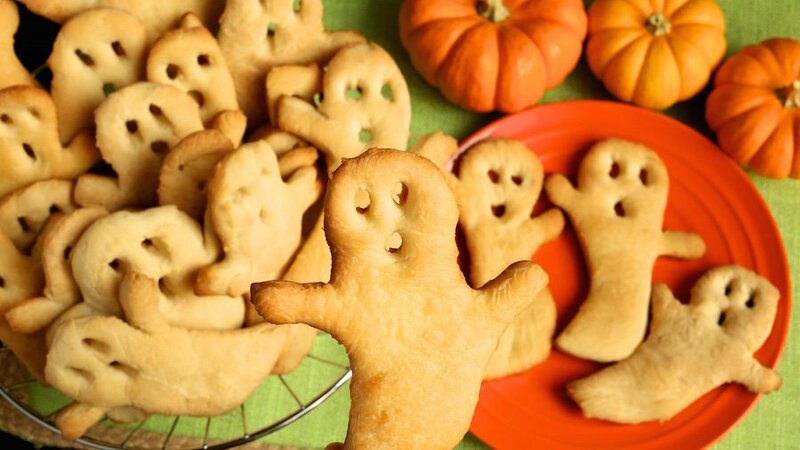 The original recipe, where I got the idea for the ghosts, used pre-made dough from a can….I decided to go homemade. The bread recipe is actually adapted from a dinner roll recipe on Cooking Classy that I thought I’d test out as ghosts!!! I think it worked out pretty well. Next time I would roll out my dough even thinner and not let the dough rise so that the ghosts are crispy all the way through. Warning: This dough is very elastic but as you’ll see, I mentioned that next time I’d probably look for a ghost cookie cutter and use that instead of painstakingly trying to hand-cut each ghost. It would just make the process go by so much faster and easier. All in all, this is really just another way to add some Halloween flavor to a party. I highly recommend. Warm up water in the microwave on high for about 1-1:30 min. Whisk in yeast and ¼ tsp. sugar until yeast has dissolved. Let rest for 5-10 min until the mixture is foamy. Pour yeast mixture into the bowl of a stand mixer and whisk in the other 1/3 cup sugar, warm milk, 5 tbsp of butter, egg, and salt until blended. Add in 2 cups of flour and mix until well combined. Switch to a dough hook, and with the mixer on a low speed, slowly add remaining 2 ½ cups of flour. Mix until dough is smooth and elastic, about 4-5 min (dough should be slightly sticky to the touch). Put the dough ball into a large, greased bowl, cover, and allow to rise in a warm place for about 1 ½ hours. Once dough has risen, punch down and divide into two equal portions. Shape each portion into a ball. Roll each ball out on to a lightly floured surface into a large rectangle (I doesn’t have to be perfect because you’re going to be cutting ghost shapes out of the dough anyways). The dough should be fairly thin (I would say about 1 cm high). Using a sharp knife (I tried using a plastic knife but the dough was so elastic it didn’t really work well), cut out the dough in the shape of a ghost (If I had thought ahead I would have actually bought a cookie cutter in the shape of a ghost. This would have made the process a WHOLE lot easier and tidier). 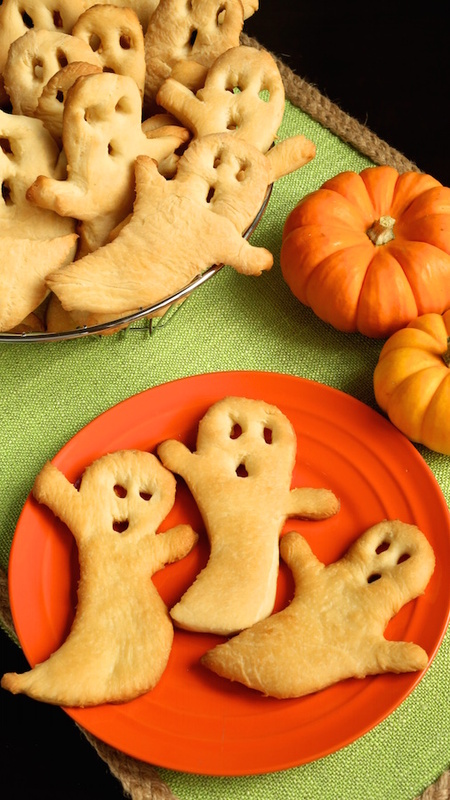 Lay each ghost out onto a baking sheet, lined with a baking mat and apply some butter on top of each. 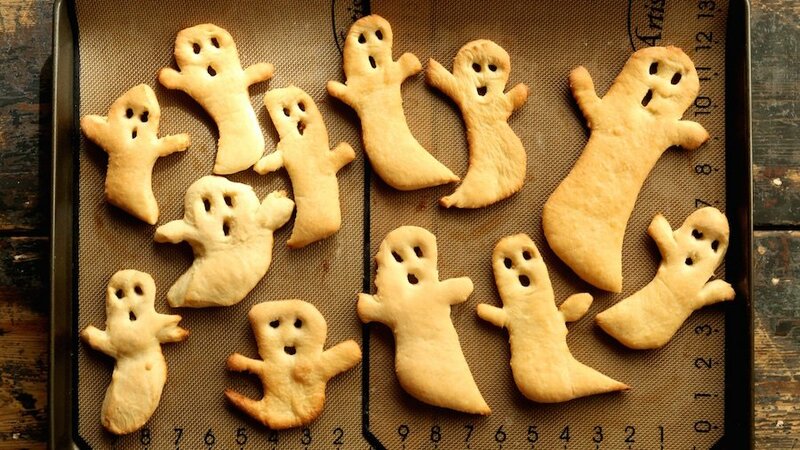 Bake ghosts in oven for 15 min or so until golden brown. Remove from oven and brush with remaining butter. Eat right away or let cool. Perfect for hummus, spreadable cheese, or dips!!! *The original recipe called for 4 ½ cups of flour. I had to add a little more but all in all, you want to make sure that the dough isn’t sticking to the sides of the bowl. It will still stick to the bottom a little bit, but again, not the sides. Id like to try these, but maybe add some cheese powder! Ooh, these ghost crisps are darling! Halloween’s over this year but I’ll be saving the recipe for next year for sure. Love them! Oh my gosh, these are soooo cute! Perfect for a Halloween party! Love the shapes you cut, wonderfully creative. A cookie cutter may save time, but this was art.